Compare funeral directors in Sutton In Ashfield and read verified reviews on the UK’s online funeral resource. Use Funeral Zone Listings to find local funeral directors in Sutton In Ashfield that meet your specific needs. You can organise the search results by ‘best rated’, 'nearest' or ‘most reviewed’. There is also a handy Google Maps feature so you can see exactly where each funeral home is in relation to each other. 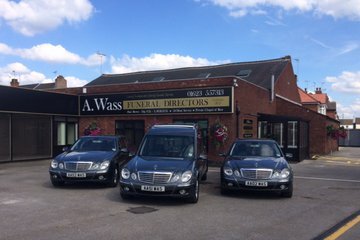 WASS funeral directors provided excellent support and assistance with my fathers funeral arrangements. Friendly, caring service nothing was too much trouble. We were kept informed. All the team were outstanding. Thank you. Excellent service from initial contact right through to the actual funeral. Communication was superb and at no time did we feel we were being hurried or asking silly questions. Advice was freely given without any pressure and we never felt that we were being steered to pick more expensive options. Would wholeheartedly recommend A W Lymn in Sutton in Ashfield for a respectful, professional service for your family.